We were really excited to learn about NECA releasing their Ultimate Friday The 13th: The Final Chapter figure when it was announced last year. 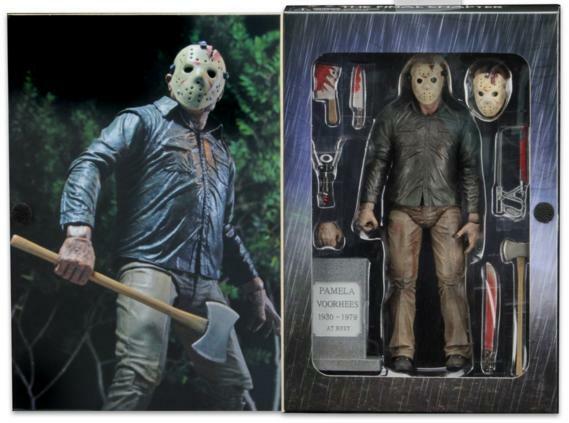 The figure combines both of the single releases of the figure from 2013 with alternate head sculpts and hockey masks along with a plethora of weapons Jason used in The Final Chapter. Today we review the figure which comes in a ultimate edition packaging and contains two hockey masks, two head sculpts and a wide array of weapons unique to the film including a machete, axe, cork screw and meat cleaver. We also get Mrs. Voorhees' grave stone! The figure is an excellent addition to any fan's collection and is worth the retail price. Watch the video review below to get a closer look at the figure and see if you think it's worthy to be on your shelf to join your Friday The 13th collection.